Are you going on a sporting trip? 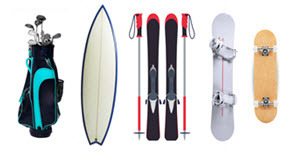 Do you need your golf clubs, surfboard, snowboard, skis or fishing equipment to arrive safely at your destination? PACK & SEND are fully equipped to help with the shipping of any and all sporting equipment. Sports equipment can be precious and expensive. PACK & SEND’s international and domestic shipping services will ensure you favourite set of golf clubs arrive safe and on time. If something were to go wrong, the Freight plus Warranty cover can reimburse you up to market value. Peace of mind is key! Instead of squeezing your surfboard into a car with all your other gear or worrying about a commercial flight, get in touch with PACK & SEND, they will help pack and ship your equipment with expert care and knowledge. Not only does PACK & SEND provide a safe service but a well-priced service.